A fade buzz cut is a twist in one of the most traditional haircuts. The coolest thing is that this modern cut is back. Now, if you hate going to the barbershop, or you just want to have the luxury of cutting your own hair in the comfort of your home, this article will teach you how to give yourself a fade buzz cut. The fade buzz cut is a stylish and modern look that works out for pretty much everyone. Still, it is a good idea to take the shape of your face into consideration to make sure you are going to look good with this one. Way too often, guys do not take those things into consideration and end up with a not-so-good style. So, to avoid all that, it is a good idea to check if it will look good on you. Another great tip is that the fade buzz cut looks really good if you grow a stubble or beard around the same length of your hair. This makes you look stylish and manlier than without it. Of course, this is a personal choice but it is definitely something to consider. If you are still in doubt, the main reasons to consider changing your current haircut style to a fade buzz is that, first of all, it is beautiful. You can definitely upgrade your looks with this haircut. Very few haircuts can do that for you. This haircut is also practical. You can do it yourself within a few minutes and be done with it. So, if you are looking for a haircut that takes a few minutes even for the inexperienced guy, this one is perfect. Besides being beautiful and practical, it is easy to do. If you take the instruction correctly, and you do it slowly and patiently at the beginning, you can achieve great results. Going straight to the point, here are the steps to give yourself a fade buzz cut. The first thing you have to do is get your hair ready to begin cutting and get all the tools you are going to use. So, wash your hair with shampoo. Eliminating the dirt makes it easier on you for the later steps. You are going to need to comb your hair to get rid of tangles, and then, trim it with scissors. Then, get all your tools. You are going to need scissors, comb, electric hair clippers, a mirror, and a towel. Once you gather everything, it is time to get real. Click here to see my reviews on Wahl clippers. The key to a great fade is the balance. You have to get the harmony between the top and the sides right. The first step toward that is deciding what is the length you want. When you do that, attach the right clipper, so you can begin cutting. You can either get started using scissors at the top, or you can use them only to adjust the length at the end. The equinox scissors that I recommend are available on Amazon. Remember that unless you are that bold, or just crazy, use a mirror the whole time. Not only to make sure you are doing it right but also for safety reasons. Again, at the top, you can either start cutting with the electric clipper or you can make use of scissors. Either way, start cutting until you achieve the length you want. A tip is to actually leave just a bit longer than what you want. This is due to the fact that you could mess up at some point, and if you do, you will have to cut even shorter to fix it. Now, if you do cut a little bit longer at first, you have room for minor mistakes. All you have to do is make use of the scissors to correct and balance things out. 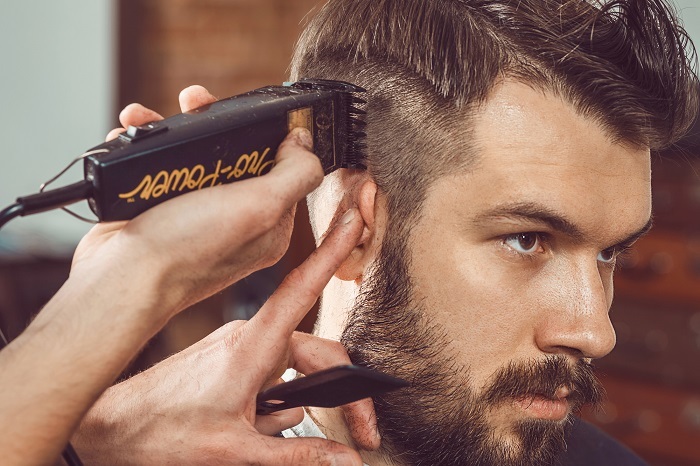 The secret of the traditional fade is to cut the sides in two different lengths. You do that by leaving the last half-inch that is closer to the top, bigger than the rest of the side. So, you get the electric clipper with a clipper one number above the other to do this. Cut half-inch up bigger. Always do it in front of the mirror to make sure you are getting the exact effect you want. The back is the hardest part. This is not because of the complexity of the cut but because you can’t see it properly. Even if you use two mirrors, you need your hands to be free to cut the hair. What you can do here is to ask someone to help you. If this is not an option, just make sure you are able to see the back of your hair. Then, get the same clipper you used on the sides to do the back. The back of the hair does not need to have the same fade illusion you used on the sides. So, what you are going to do is cut it evenly throughout the whole back. The hardest part is over. You gave yourself a fade buzz cut. Now, you can enjoy one of the best masculine haircuts ever. Just give a nice finish with razors on the area near the ear and the bottom of the back. To maintain this cut, make sure you are cutting your hair every two weeks or so. This depends a lot on how fast your hair grows since it changes from person to person. Now that you have all the tools to give yourself the perfect fade buzz cut, go get busy. Learning how to give yourself a fade buzz cut is the best way to save for your own haircut. Just remember to do it slowly, if it is your first time cutting your own hair, and also make sure to do it in front of a mirror. If you follow these easy steps, you are sure to achieve a great result.